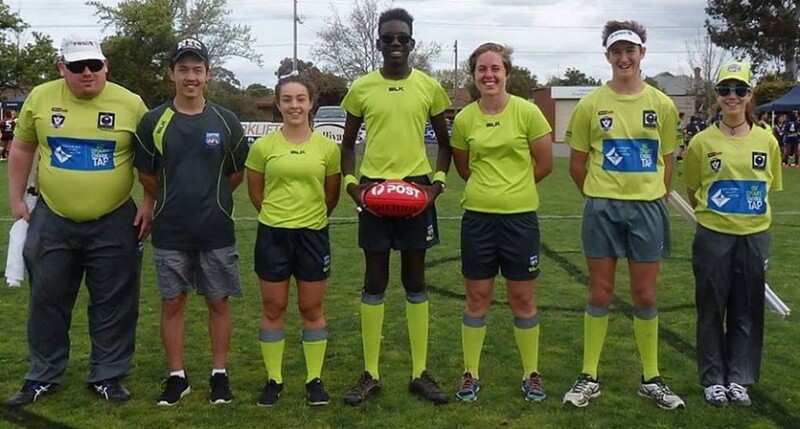 Whether you’re a previous AFL football player who isn’t quite ready to leave the game, or you’re just keen to get involved in AFL, the AFL Umpire Summer Development Program is for you. With the end of the 2017 season drawing to an end, the beginning of the 2018 pre-season is just around the corner. This free 6-week program is designed for people of all ages to help development the skills needed to umpire next season. Umpire Development Co-ordinator Rohan Briggs came up with the idea to encourage new umpires to the game and provide them the chance to gain skills before the season actually starts. “AFL footballers are constantly training and developing their skills during the off season but there wasn’t anything like that for umpires, so I thought I would fill that gap,” Briggs said. The program accommodates for any age, with already registered people being anywhere from age 13 to 54 years old. The program also provides the perfect occasion to learn hints and tips from the industries best. All sessions will cover both the theory and practise components of field, goal and boundary umpiring. The theory component will be in indoors for the first 30 minutes and in the last 30 minutes participants head outside to put that theory into practise. “While indoors we focus on the vision. We will watch footage that is of top AFL level and work through what a free kick looks like, what a 50-metre penalty looks like and analyse the terminology and signals the umpires use and what they mean,” Briggs explained. “It will be focusing on getting them to think about what their decision would be when they are in a particular situation. Upon completion of the program, participants will receive a certificate and after sitting an online test and will have the opportunity to umpire in pre-season and round one games. “We will assess components such as their voice, their signals and their use of the whistle and then decide to put them on the field in a real match and off they go,” he said. Although with umpiring development, Briggs says that this program will help develop confidence and fitness and build important life skills such as communication and conflict management. “When I was younger I used to be really shy and would be nervous when speaking in front of a crowd of 20 to 30 people. But after a year of umpiring I learnt how to use my voice and take control of a game,” Briggs said. “I gained confidence that I never had before and can now speak in front of 40 to 700 people no worries at all. The program begins on Tuesday the 7th of November from 6pm to 7pm at Leyshon Park Yeronga. “If you’re not sure, come down, have a go and see if you enjoy it. There is no obligation for you to umpire in 2018,” Briggs said.